Ahhh! If you ask me Costata Romanesco is far and away the best tasting squash we grow! This heirloom variety has its origins in Rome, Italy - costato being Latin for ribs and you get the 'Roman'esco part I'm sure. 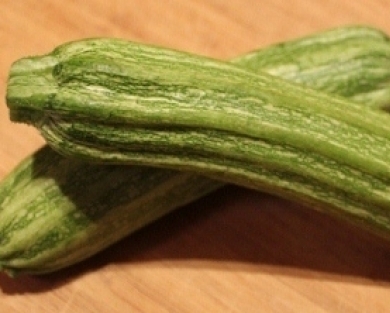 This zucchini shaped variety is ridged, so when cut along the vertical what would be boring circular discs turn into cool star-shaped slices. The best thing about this squash is it's texture and flavor - it's a firm, meaty squash that holds it shape when cooked (no mushiness here) and since taste can be difficult to abscribe I'll just tell you that it's beyond all your squash dreams! Ideal for zucchini parmesan or squash-gratins their large size and tenderness makes them easy to slice long ways - for squashy lasagna "noodles" as well. Me, I can't resist sauteing one up to include in my black bean tacos!